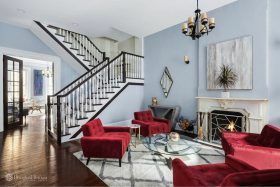 This Yorkville townhouse at 433 East 85th Street manages to strike the right balance between historic and modern. The home was built in the 1880s, according to the listing, but it has hit the market for the first time since a major renovation. Prewar details like wood-burning fireplaces and moldings are complemented by impressive new finishes of imported Calacatta Gold, marble glass mosaics, and natural limestone. And the backyard was totally redone, now decked out with 700 square feet of comfortable outdoor space. It’s all asking $6.5 million.